Each new year brings change and 2017 is no different when it comes to keeping up with your retirement savings accounts. 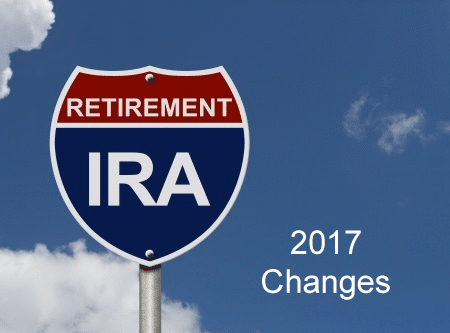 Here is what you need to know when it comes to 2017 IRA changes. After age 70 ½, withdrawals from traditional IRAs are required and income tax may be due on each distribution. However, if you’re age 70 ½ and donate all or part of your distribution ($100,000 max) directly to a qualified charity you won’t owe tax on that transaction. Introduced as a temporary measure in 2006, this ruling was made permanent by an appropriations bill in December 2015. So what should you do? You can transfer funds directly to an eligible charity regardless of whether you itemize your deductions. Note: Distributions from employer sponsored retirement plans (including Simple IRA or Simplified Employee Pension (SEP) plans) aren’t eligible. Funds must be transferred by the IRA trustee to the charity. These funds may result in lower taxable income for the donor. Not all charities are eligible and if the distribution is excluded from income, no deductions may be taken on the distributed amount. 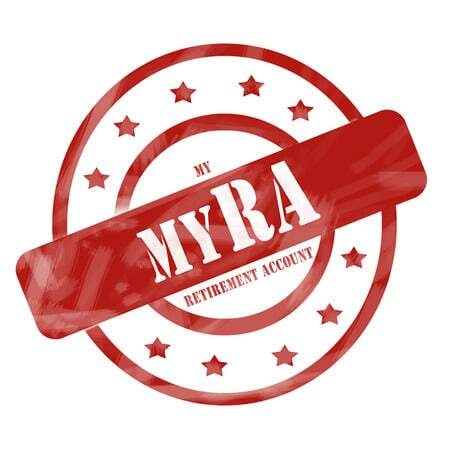 myRA launched in November 2015 and is aimed at those who don’t have access to a 401(k). These savers can contribute up to $5,500 a year to this Roth Account ($6,500 if they’re 50 or older). The main thing to know here is that there is only one investment option – a Treasury savings bond that pays a variable interest rate. The good news is it is guaranteed never to lose its value. However, there is a limit of $15,000 (or 30 years of contributions) before your money will be transferred to a private sector Roth IRA. This won’t help you with this year’s taxes, but will be an asset in the future for every year the account grows. You can earn an extra $1,000 in 2016 and still save for your retirement. The phase-out comes in for individuals whose adjusted gross income is between $117,000 and $132,000 (or $184,000 to $194,000 for couples). Withdrawals after age 59 ½ are tax free and deposits into this account are made with after-tax dollars. The adjusted gross income cutoffs for 2016 are $30,750 for individuals, $46,125 for heads of households and $61,500 for couples. The valuable tax credit for low and moderate income workers is between 10-50% of the amount saved in a 401(k) or IRA up to $2,000 for individuals and $4,000 for couples. This credit can be claimed in addition to tax deductions for traditional 401(k) or an IRA contribution or for a Roth account including the new myRA. Though the numbers seem cut-and-dry, planning for retirement using your IRA is more art than science. That is why it’s important to rely on experts to help make sure you are taking maximum advantage of your retirement nest egg. Contact our office today to review and fine-tune your retirement income strategies.